Address: 15206 Beach Way Drive Location: Corpus Christi Type: Townhouse View: Beach View Area: 1305 Sq.Ft. Padre Beach View 206 is a beach-side townhouse built in 2015 that will have you feeling like you've escaped to a far off Tropical Paradise! 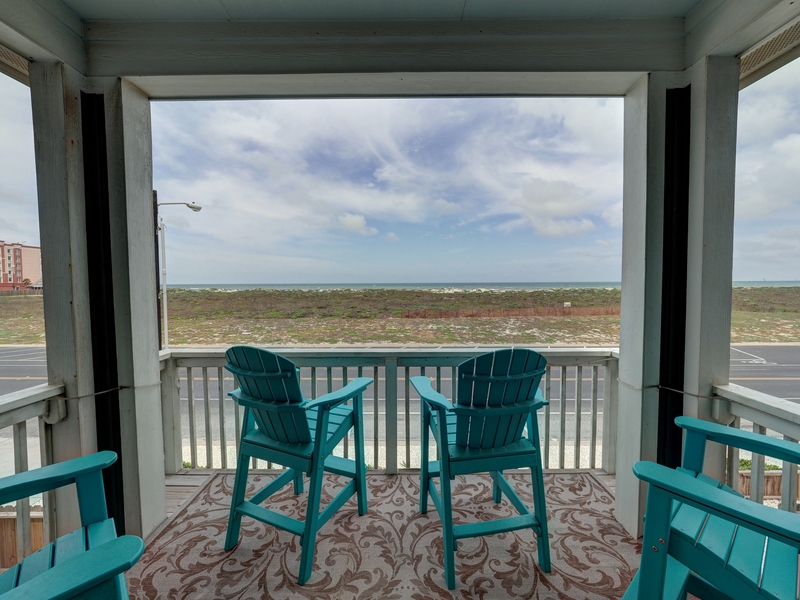 Let the ocean waves crashing ashore outside your patio door lull you to sleep at night, then awaken to a beautiful view of the sun rising over the Gulf of Mexico while sipping your morning coffee on your private balcony or patio. This unit features Tiki decor throughout including bamboo, palms, surf theme and of course, your very own Tiki Hut Barefoot Bar equipped with a Margaritaville Margarita Machine! The entire 1st floor is a great room that features a fully stocked kitchen, living and dining areas. This is the perfect common area to spend time with family and friends. Also, downstairs is a half bathroom and laundry room. This unit offers a queen size fold out bed in the living room credenza cabinet. Moving upstairs you'll find a loft equipped with a full size click-clack sofa and 3 bedrooms. The master bedroom now comes with a king size bed with private bathroom and access to a private balcony looking out over the Gulf of Mexico. The two additional bedrooms share a hallway bathroom. In one bedroom you'll find a king size bed and the other room has a full/twin bunk bed with a twin size trundle bed. This property also offers a private patio with private entry/exit towards the beach and a picnic table and additional patio furniture. The outdoor space at Padre Beach View showcases Coastal style architecture similar to East coast vacation homes. Included is a private, in-ground saltwater pool that's heated for year-round enjoyment with a splash zone for the kids. There's ample seating available around the pool including poolside cabanas, picnic tables and lounge chairs. BBQ grills are also available in the pool area. The entire complex features lush tropical landscaping and cool coastal color schemes. And it's all just steps from the beach! To take a must see Virtual Tour of this Townhouse across the street from the beach CLICK HERE Linens for every bed and towels for every guest are provided. This unit requires a 2 night minimum stay. Overall we had a nice week. The condo was well equipped and attractively decorated. When we arrived there was a very strong insecticide odor. The odor was so offensive we weren't sure we could stay. We opened the windows and doors to clear the air, but unfortunately let in lots of mosquitoes. That helped enough to where we could stay but the odor didn't go away for 3 or 4 days. On day 4 we noticed ants in the kitchen coming from the locked closet, leading us to believe that the insecticide was an attempt to solve the ant problem. Other than the insects we enjoyed our stay. When we walked in, I was surprised at how accurate the pictures were to the place. We absolutely loved the entire home. It was just what we were looking for. We tried to book it for fathers day but it is already booked. It rained the first night we were there and the kids enjoyed playing with the game consoles they had upstairs and downstairs. TV and blue ray in every room. Outside of the master bedroom we had a balcony with Beach view.. it was amazing! Very Nice Condo, great location fun décor. We had 6 people so lots of room, I would say more than 8 people would be crowded but very nice place to stay, will rent again! It was very nice and very clean. My family had a blast swimming at the pool. Although the power went out for a couple hours due to ownership change, the customer service was superb making sure everything was ok. I would rent this condo again. Our condo was spacious, , clean, great location to pool and the beach !!! Loved the Tiki Bar motif. Well appointed kitchen with all necessities. Everything was perfect! Great place that will hold many special memories. We had the best stay here! The place is even better than the photos, in an awesome location, and the management company was super friendly and reliable. We are planning on making this an annual trip and will definitely be back! I could not recommend this place more, such a perfect home away from home. Very enjoyable, Great place to stay. Had a great time. Padre Beach View 206K...AKA "Tiki House" by my girlfriends, was one of the best vacation rental properties I have ever rented. The house was fun, inviting & very well kept! Everything was easily accessible from the condo...we walked to the beach & to the local restaurant and everything else- shopping was a quick drive. It was a very pleasurable stay. We will definitely stay in this one again! A quick weekend trip to visit my son at college for his birthday. We had 3 generations at the condo and it was perfect! The condo was clean, everything was provided in the condo and the decorations were incredible. Location was perfect for going to beach during the day and at night for bonfires on the beach. The back patio is smaller than it seems in pictures but it wasn't even an issue. Loved the small touches in the decorating that you would notice little things even on the last day. Highly recommend this condo for its location and overall amenities. The Boathouse restaurant/bar is within walking distance, we also visited Mikel May's pier and Angry Marlin restaurants just down the street. Can't wait to go back again on our next visit. We spent the month of March in Padre Beach View 206K. The property description was accurate. The main level was everything we had expected. The kitchen was great, well stocked with everything we needed. It worked perfect for a large group. Living room worked well also. The tv sound was not that great, but all the tv's in the place was great when we had guests. The carpeting on the steps leading to the bedrooms really needs to be cleaned or replaced. The bedrooms were fine. The master bedroom bed could be updated. Sheets did not fit the bed. It was crowded when we had 8 people, but that was only for a short time. Loved the deck and the deck chairs were wonderful. Lovely morning coffee and views of the Gulf. Laundry facilities worked well. The pool was great for grandchildren, however, it was pretty chilly for being a heated pool. The unit was very clean and well maintained even with the few concerns mentioned above. We had very good customer service from management. We very much enjoyed the beach, walking and looking for shells. We had two fires down on the beach and that was fun. Did enjoy riding horses on the beach, Bob's Pier, great seafood restaurants, National Seashore, The Lexington, The Texas Aquarium, a short trip to San Antonio and Kingsville. We would highly recommend this property to friends or relatives. We stayed at Padre Beach View 206K. OMG!!! What a beautiful place. My son visiting from Colorado is a surfer and broke his leg before coming down. This place was spectacular. The décor was great. Very clean, spacious, comfortable. Close to the beach. My children and grandchildren had a fantastic time at the pool!!! Very family oriented. The Staff at Padre Escapes are wonderful a Special Thank You to Jeremy for finding the best place for my family and making this vacation possible for us!!! I highly recommend Padre Escapes for your rentals. We will be using them again for future gatherings!! We all loved this place. It was a big enough place for us to all spread out and have room. The only complaint we have is the two extra sleeping areas (futon upstairs and credenza in living room) were very uncomfortable. I would not count those as a place to have someone sleep. Even my 5 year old woke up from the cadenza and complained of it being uncomfortable and she is a child and they can sleep anywhere. Other than that, it was a great place to stay and we will be back again next year. In love with the house! Very comfortable, clean & nice, we really enjoy that trip . First time using VRBO and was very pleased. This was a family vacation, 6 adults and 2 children. The space was just right for the number of people we had. Found it to be clean and very comfortable. The pool was great. We rented a golf cart which made the stay so fun. Overall pleased with our choice for this vacation! Had a good stay with family over the 4th of July 2015. Pick of information for rental was easy. Location and condition of rental was good. Glad to hear you enjoyed your stay. Thank you for the feedback, we hope to see you back again soon. We've vacationed on the Island dozens of times and Padre Beach View is the absolute best property we've ever stayed in. Gorgeous on the inside and a great view. Nice pool, great location and it was stocked with everything we needed. Can't wait to come back! We loved our stay. The beach theme was perfect. Everyone we talked to in regards to our unit we extremely polite, helpful and prompt in attention. We would definitely stay with you again. Our family of five stayed here for 5 weeks in the fall as we were in the process of moving and loved every minute of it. The condo has everything you could need for a weekend or a monthlong stay. Plenty of towels, bedding, and kitchen supplies. Wonderfully decorated. My kids enjoyed the pool area and we were able to walk to the beach. The management company was great - booking, check-in, and checkout were very easy. We would absolutely stay here again and would recommend this unit to friends. Great location ! The townhome was beautiful and spacious. Looking forward to planning our next stay. Great to hear you enjoyed your time with us. Hope we see you back again soon! Would have loved to stay there forever. And so did everyone else with us. We held a family reunion over Thanksgiving, using two different rental units at Padre Beach View. Our unit (206) has a great ocean view, and the Tiki + surfing decor is fun. The unit was well equipped, and the large seating capacity of the dining area and kitchen island was a big help for Thanksgiving dinner. My minor complaints are (1) the management provided not even a single coffee filter to get us started the first morning; (2) despite our renting for 8 days, management provided only 1 garbage bag and 2 dishwasher packets (come on, don't be so cheap! ); (3) it's hard to believe this complex provides no recycling bins---that's just environmentally irresponsible, especially in a city that has curbside recycling pickup! Great to hear you all enjoyed the property so much. Sorry to hear you were disappointed about the coffee filters, trash bags and dishwasher packets. We do not supply coffee filters but typically other guests leave these behind and we will leave them in the property for the next guest to use. We do advertise that we only stock "a starter supply of bath soap, dish soap, toilet paper, paper towels, detergent, and trash bags" and since we manage your family's unit (the other one you stayed in) it surprises me that this would be such a disappointment to you. I love the recycling bins idea and I have passed your recommendation on to the HOA. Thank you very much for your feedback. It's always fun to get together, and this property was the icing on the cake!! There was plenty of room for our 3 families... The kids enjoyed the PlayStation and Xbox during downtime and the grown ups appreciated the Margarita machine and well-stocked kitchen! We loved the easy access to the beach and heated saltwater pool! We can't wait to plan our next stay! Thank you for sharing this great property! The rental was clean, well kept, and a nice retreat. The description of the property was spot on. The layout works well for large families or families with kids. Access to the beach is right across the street and a short walk. Also, the complex provides a nice pool, easy parking, etc. I would definitely use the property again. I rented this condo for a gathering with my children! We had a great time, the proximity to the beach was perfect. A walk down a sidewalk took us to the sea wall and a few steps down and we were right on the beach. The condo was furnished very well and a plus was the Margarita Machine that turned out perfect frozen margaritas. We loved the salt water pool. Great balcony off the guest bedroom for a perfect spot for viewing sunrises and first cup of coffee to start the day! We will definable be back soon!! We were pleased to find this jewel at the last minute. The check in process was great. Having to drive over 400 miles to get there we were close to the latest check in time. After calling the office staff were very nice and stated they would wait on us and they did. Management was excellent - checked in us to insure all was well. The facility was beautiful and very comfortable for my husband and our three grandchildren. We had a great stay at unit 206! Next time we will get a 4 bedroom, but overall we had enough room. We really enjoyed the margarita machine, the place was very clean and it was a short walk to the beach. We had a slight problem with the door code (after hours) and the management co fixed it immediately. We loved everything about our rental. It was clean, well stocked and located in an area where we experienced both tranquillity, and places to kick up our heels. The management at Padre Escapes made us feel important and respected. This was our first month long stay anywhere, and will be tough to beat. We loved it. Our second trip/stay in the townhomes and we chose a different unit. Plenty of room for us to enjoy being together or some time apart. Loved the table, great for meals together and just conversing. Beach just a tad away so we made many trips back and forth. Downside, the unit could have used some extra cleaning. All of us kept stepping on stickers embedded in the rugs throughout, dusting, sweeping and some of the dishes were dirty. The master bedroom bed left a lot to be desired. Overall, we had a blast and will definitely come down again!!! Thank you for your feedback. Being as close to the beach as these properties are sand and stickers are always a battle. We'll have those dishes double checked but it is hard to inspect all the dishes when the previous renter put them away dirty and it is tough to provide the comfort of rugs without a periodic annoying sticker burr showing up ? vacuums do not always extract the burrs. Thank you again for your feedback, hope we see you back again soon. On such short notice we were amazed by how great this location was! Great location and short walking distance to the beach. The condo is very spacious and accommodating for large families or groups. Assigned parking is a very short walk from the front door and street parking is even closer to the back patio area which was really convenient for loading and unloading luggage, ice chests, chairs, etc. Great to hear you enjoyed your stay! Hope we see you back again soon. Thank you for the feedback. Glad you enjoyed the property, This is the first we've heard of a "damp and musty" smell, we will certainly look into it and address it if needed. Hope we see you back again soon. The townhouse was just as the pictures showed. The kitchen had everything we needed to prepare meals. Having a high chair was useful. Great to hear you enjoyed it so much. Thank you for your feedback, hope we see you back again soon. We had a great time. The décor of the tiki hut-surf shack is a lot of fun. 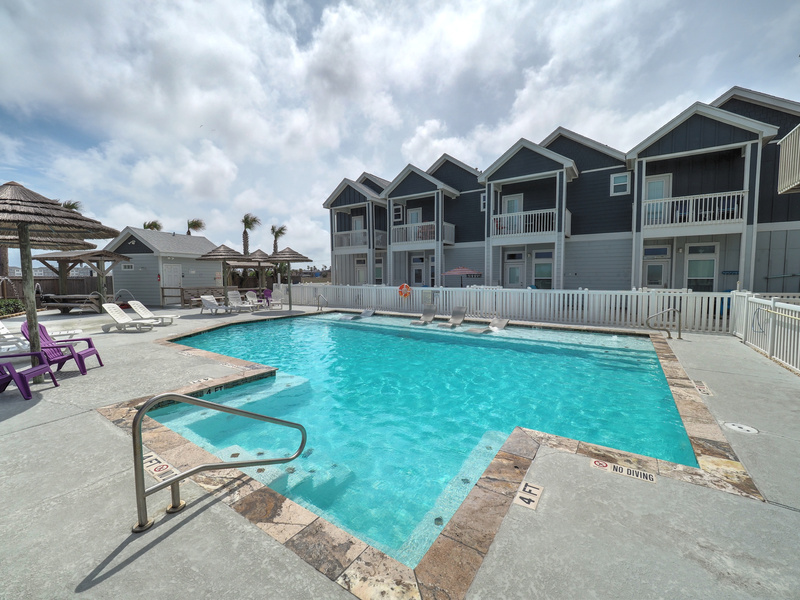 The location is great close to the water park,the beach,HEB,walmart,etc. My wife said when we go back she wants to stay at the same address.